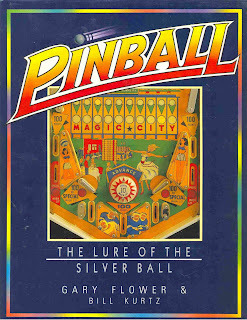 There's a nice selection of reading fodder out there in pinball-land and The Lure of the Silver Ball certainly makes our list of essentials. The Pinball Blog catches up with the author to find out who, where and why. The Pinball Blog. So you're Gary Flower, author of The Lure of the Silver Ball. How on earth did you go about getting a book about pinball published? Gary Flower. The publisher approached me, which made it easy to get the publishing deal. Putting it together was a little harder. TPB. What have you been doing (pinball-wise) since? GF. Frequent trips to Chicago, the pinball capital of the world to keep my knowledge up to date. Have also acted as a consultant for the Royal Shakespeare Company and TV as well as writing a sequel to the book published as a CD-rom, complete with pinball sims. TPB. Will there be anybody designing and manufacturing pinball machines in 5 years? GF. I hope so, but I won't be betting on it. TPB. You must have met some incredible people through your pinball connections. Is there one you feel particularly lucky to have met? GF. I'm honoured to count several of my pinball heroes as personal friends as well as many regular pinball people who do a lot for little reward and recognition such as yourself (UK Pinball Show), Martin Ayub (Pinball News & Tournament Director) and Jim Schelberg (PinGame Journal). Generally speaking I'm blown away by the pinball community around the world - what a great bunch of people. TPB. Are we going to see another pinball book anytime soon? GF. Unlikely, but open to offers - I have lots of ideas! TPB. Is there a place or event that you would recommend every enthusiast should see before they die? TPB. What is your favourite machine and why? GF. Counterforce (Gottlieb). Simple yet challenging. Getaway: High Speed II. I just can't leave it alone, great sounds, lighting, rules - always exciting to play. This is my desert island pin - rules have enough to hold my interest without being too difficult to understand. TPB. Could anything have been done to prevent the decline of pinball? GF. Lower prices and reliability - a paradox when there's more stuff than ever on the playfield. TPB. What else makes you tick away from pinball? GF. Poker, travel, fine dining and good company. TPB. Finally, can you sum up pinball in a single word or sentence? GF. The ultimate boys toy for the ultimate boy. Many thanks to Gary Flower for being the first of our Pinball Heroes. Watch out as we hunt down and pester more people on the inside of our great hobby. If you would like to suggest somebody to feature on Pinball Heroes then drop us a line! I bought his book back in the 80's, so he's been a hero for a long while now. It was a highlight of my pinball life to get to meet him a couple of years ago. Thanks Michael. You need to tell *that* story about how you plan to be remembered one day for the blog! Pics 'n all! How can I get in touch with this guy? I want to tell him how grateful I am for his book.